Supanova Pop Culture Expo is where fans come face to face with celebrities and the creative talent that inspire their imaginary worlds under one big roof. Gathered from and surrounded by the wonderful worlds of science-fiction, pulp TV/movies, toys, console gaming, trading cards, animation/cartoons, fantasy, comic books, entertainment technology, books, internet sites and fan-clubs, the result is an amazing atmosphere tailor made for expessing your inner geek and where getting into cosplay (cos-tume role-play) is the obvious thing to do! So whether you’re seven or seventy, Supanova is a great excuse to get your geek on! 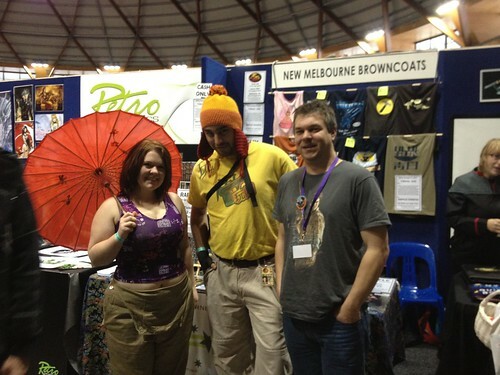 The Browncoat Charity Booth first joined forces with Sydney Browncoats at Supanova on 18-20 June 2010. That year brought a stellar lineup for fans of the Whedonverse, with Summer Glau (Buffy, Firefly, Serenity, Dollhouse), Eliza Dusku (Buffy, Angel, Dollhouse), Charisma Carpenter (Buffy, Angel), Dichen Lachman (Dollhouse) and Mark Lutz (Angel). Among the many cool things for sale include Dr Horrible DVDs and Dollhouse DVDs, as well as Serenity mini-posters, Browncoat lanyards and more, plus the opportunity to purchase tickets for Can’t Stop the Serenity Sydney on June 26. We’ve been back every year since, and are always excited to meet Browncoats, offer great Whedonverse related goodies for sale and raise money for charity!